Greetings!! 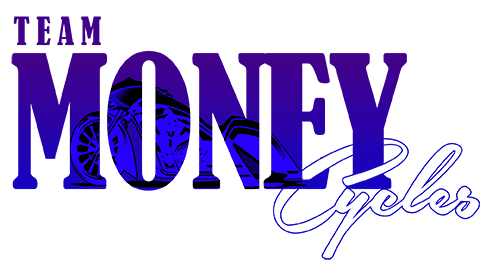 !Team Money Cycles will be hosting the Motorcycle Audio festivities at the Tobacco Road Harley-Davidson Capital City Bike Fest 2018 in Raleigh NC!!! “SOS Rumble in Raleigh” late night sound competition!!! That’s right we are turning it into a late night party folks!!!! Saturday September 22, 2018 at Tobacco Road Harley-Davidson!!! This will be a INDOOR Sound Off!!! 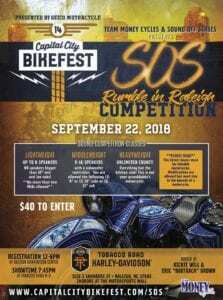 **Registration will begin at the Raleigh Convention center from noon-6pm on Saturday September 22,2018 look for the Team Money Cycles vendor section!!! Don’t miss “SOS Raleigh/ Da Rumble In Raleigh” late night sound competition/ PARTY!!!! That’s right immediately following the Capital City Bike Fest Show Saturday we will have a cruise featuring some BAD BAGGERS, Hot Rods, Low Riders and more from the Raleigh Convention Center to Tobacco Road Harley-Davidson!!!! Once we arrive it’s time for some SOS ACTION!!!! Inside the walls of the Tobacco Road Harley-Davidson you will witness some of the baddest in Motorcycle Audio “PUT IN WORK”!!!!! Don’t miss it!!! Doors open at 7:00pm!!!! – Tobacco Road Harley-Davidson doors will be open at 7pm.